Learn about the Proceedix app, get the latest downloads, view our videos, read client testimonials, press articles and find out about our point of view in various white papers. AMA and Proceedix are delighted to officially announce their partnership to leverage the very best of both of their respective solutions. This combination empowers technicians and operators with state-of-the-art technology for remote assistance and digital work flow execution. This is the bizarre story of how the Proceedix app on Google Glass made its way into a nineteenth-century Italian opera by Rossini. Proceedix will be expanding its digital inspection and instruction platform with three more brands of smart glasses: Iristick, RealWear and Vuzix. Proceedix has run on Glass since 2014 and will now be available on four different HUD smart glasses by the beginning of this summer. Somewhere in the lofty mists of the cloud, we find Industry 4.0, a term that remains puzzling for many. What is it exactly? Is it something for my company? How can I make the most of the technology? The best way to clear things up is through a case through which partners have been exploring technologies for getting right production info to the operator. In this presentation, Rick Reuter (AGCO) answers an essential question: should we use smart glasses in our enterprise? When people first hear about this new ‘tool’, they look for ways to implement it in their company. Reuter clearly explains why this is not the correct approach. With Proceedix tedious paperwork for inspections becomes a thing from the past. 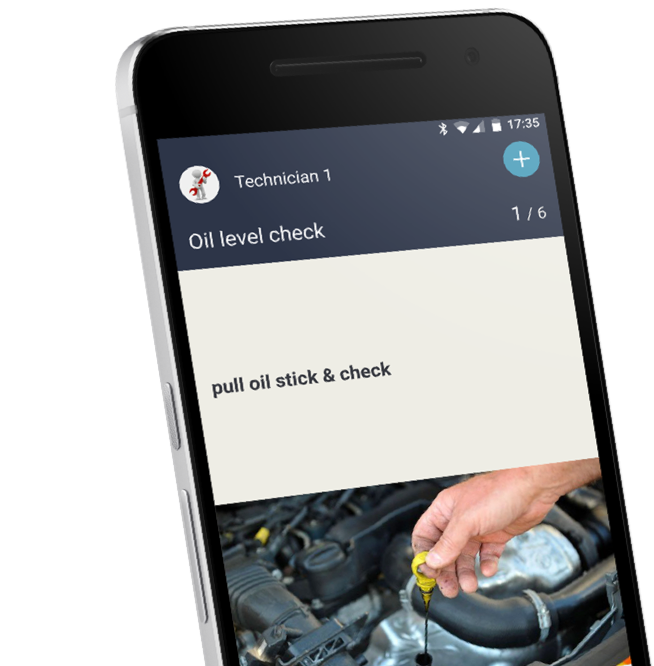 Equipped with tablets, smartphones or smart glasses your technicians are able to consult all relevant information to perform their jobs. Watch the video to learn more. Proceedix on Glass has reduced machinery production time by 25 percent and inspection times by 30 percent. Employees of AGCO are now working smarter, faster and safer because they have the information they need right in their line of sight. Streaming video of the presentation of Peggy Gulick of AGCO at the Augmented World Expo 2017. Peggy explains the (long) journey of AGCO to find solutions to continuously improve work processes in the plant. Proceedix announced today that it has raised 2 million euros in scale-up funding. The funding is being underwritten by the existing shareholders and new investors. The new investors are The Innovation Fund, Saffelberg Investments and Pentacon. It’s been a week now since we have had the pleasure to participate at the Augmented World Expo in Santa Clara, CA. This event is, with 4700 visitors, over 350 speakers and 200 exhibitors, the largest event in the world in the AR/VR space. At this year's Augmented World Expo, Proceedix announces a partnership with Iristick, a producer of smart safety glasses for enterprise. We were happy to receive an invitation from Peggy Gulick, Director Business Process Improvement at AGCO and participate in a panel discussion last week. An example of an Internet of Things application in business can be found at Philips in Turnhout. Proceedix, Sirris, and Flanders Make organized a workshop on ‘smart’ operators in the manufacturing and assembly industry. Peter Verstraeten (CEO Proceedix) was invited by Besix to the Secura fair to demonstrate smart glasses to a wider audience. As of February, Proceedix has a new, USA-based office. We are located in the San Francisco Bay Area where Charlotte Feryn, our new VP North America will be happy to welcome you! In a perfect world, inspections would be pointless and a pure waste of energy. Yet a perfect world with infallible people and systems does not exist. The proverb “every Jack has his Jill” applies for smart glasses in enterprise too. Yet some Jacks seem to be more popular than others. Best practice: Be realistic about what is right for your industry and your business, as well as the technology’s current capabilities and limitations. Streaming video of Peter Verstraeten’s (CEO Proceedix) presentation on the Augmented World Expo 2016 (Santa Clara, USA). BrainXchange recently sent over some questions to Peggy Gulick, Director of Business Process Improvement at AGCO. Learn how you can translate critical work instructions into a step-by-step instruction guide on your operators' smart phone, tablet, watch or smart glasses. AGCO was awarded as winner on the 12th ML Awards in the Internet of Things in Manufacturing Leadership category for it Wearable Technology project. Electronic document management and other digitalization initiatives definitely help enterprises to reduce the paper pile. Philips was looking for new ways to work as efficiently as possible to help the company enter the Industry 4.0 evolution. For sure many human activities in today’s enterprise will become redundant tomorrow because of the IoT. Starting your own business and changing the strategic focus immediately. For many startups, this is a well-known scenario. Since recently, parameters in the packaging department of FrieslandCampina in Aalter have been monitored on one of the packaging lines, using a tablet running Proceedix. Excessive amounts of paperwork, with multiple checklists and procedures, errors in order picking etc. The current inability to use Glass with prescription lenses has been a widely discussed problem ever since Glass was launched. Although Google Glass is not yet generally available – rumour says it will be by mid 2014 – the new challengers all pretend that they are "doing better than Google Glass".